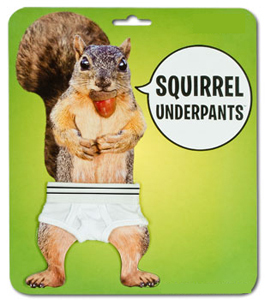 Oh, Mr. Squirrel in Underpants…you are such a tease! I’m assuming these squirrels were never put through any kind of potty training, so instead of naked squirrels running around your yard, you’ll now have a bunch of squirrels with tiny underpants filled with urine and droppings. Which, sadly, is also very likely to be a Fetish for Somebody.